It is recommended that in order to get best results of this plugin you should have PHP version 5.6 or above on your site. Unzip the Bulk Purchase and Group Registration folder to find two zip files within. One is to be installed on WordPress and the other goes on Moodle. Upon purchasing the Bulk Purchase Extension for Edwiser Bridge, an email containing the purchase receipt, download link, and license key will be sent to your registered email id. You can download the extension using the download link provided. Now click on the ‘Upload Plugin‘ button and upload the ” Bulk Purchase & Group Registration ” extension file which is meant for WordPress that you downloaded in the first step. Alternatively, you can unzip and upload the ” Bulk Purchase & Group Registration ” plugin folder using the FTP application of your choice. Once you have activated the plugin a new tab labeled as ‘Bulk Purchase’ will be created in the Edwiser Bridge > Settings > “Licenses” tab. The following screen will be available on clicking on this option. Enter the license key provided in the purchase email in the ‘License Key‘ field and click the ‘Activate License‘ button. Note: Every license issued is a single site license. You cannot use it on more than one website simultaneously. If you need migrate the plugin from your staging site to your live site you will have to first deactivate license key from the staging site and then use the same key on the live site or you could buy more than one license key for your site. Make sure that WooCommerce Integration extension of Edwiser Bridge is updated to the latest version. Select ” wdmgroupregistration.zip “, select Plugin Type as Local Plugin and upload it. In the External Service that is connected to your Edwiser Bridge, add the following functions. Once this is done, go to Edwiser Bridge Plugin on your WordPress site where you will see the Update Bulk Purchase section. Click on Start Migration to import your existing Bulk Purchase data to the new version if you were using Bulk Purchase version below v2.0.0 and updated to v2.0.0 or higher version. Note: If you are already using Bulk Purchase v2.0.0 or higher or freshly installed the latest version then you should not click on Start Migration. Click on Delete Migration Menu if you are using v2.0.0 or higher. Select the checkbox to enable any particular product for group purchase. When a client wants to purchase more than one seats in a course, he needs to tick the Enable Bulk Purchase tick-box. This will enable the selection box to select more than one course. Once the payment is complete the user will get mail containing link to “Enroll Students” page. This page is automatically created by the “Edwiser Bridge-Bulk Purchase” plugin when it is activated. 1) The Select Group dropdown will show you all the Group of courses that you have purchased in bulk. Select the Group which you wish to add your students to. 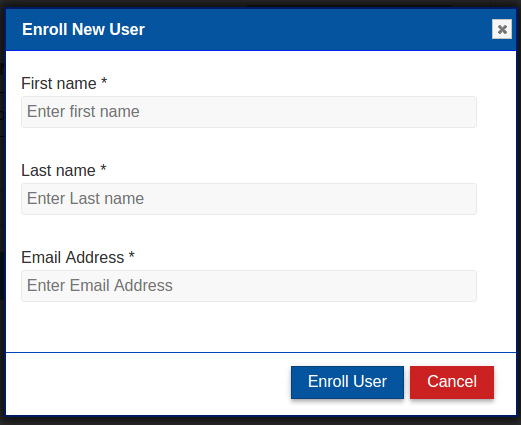 2) You could manually add the details of the users whom you enroll to the course by clicking on “Add New User” button. 3) Enter first name, last name and email address of the user you are enrolling and click Enroll User. 1. Go to the Enroll_students page. 2. Select the Group you wish to add more seats to. 3. Then click on the Add Quantity tab. 4. In Enter Quantity, enter the number the seats you need and then click on Proceed to Checkout. 1. Select the group to which you wish to add more products to. 2. Click on Add Products. You will see a list of all the products that have Group Purchase enabled.Select all the products you want to add to the group and proceed to checkout. The quantity for these products will be automatically selected as per the number of seats you have in that group. 3. Select all the products you want to add to the group and proceed to checkout. The quantity for these products will be automatically selected as per the number of seats you have in that group. 4. Once purchase is complete, you will be able to enroll students in all the courses together in the group. Still have some doubts about the plugin? Head over to FAQ section to clear most of them. * Feature: Added functionality to create the groups on moodle. * Feature: Added functionality to add the products in same group. * Feature: Functionality to add the members in group. 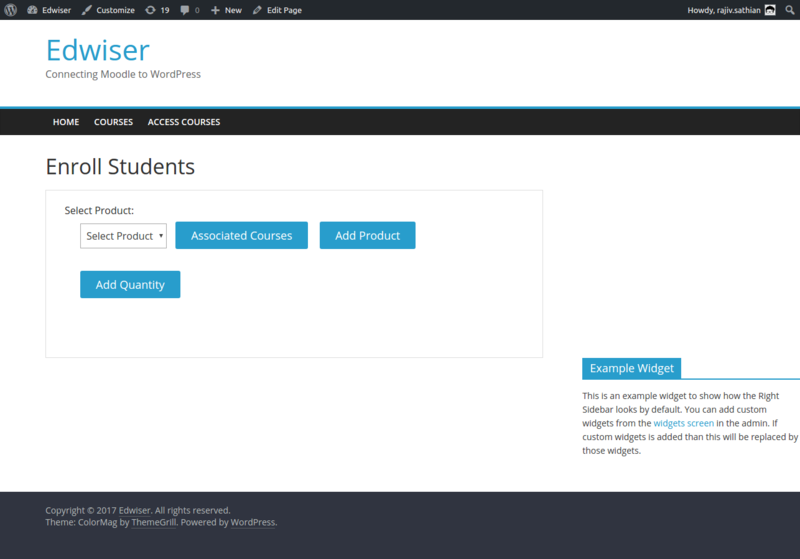 * Feature: Functionality to add more courses in the same group. * Feature: Functionality to add more quantity for all the group products. * Feature: Functionality to view group associated courses. 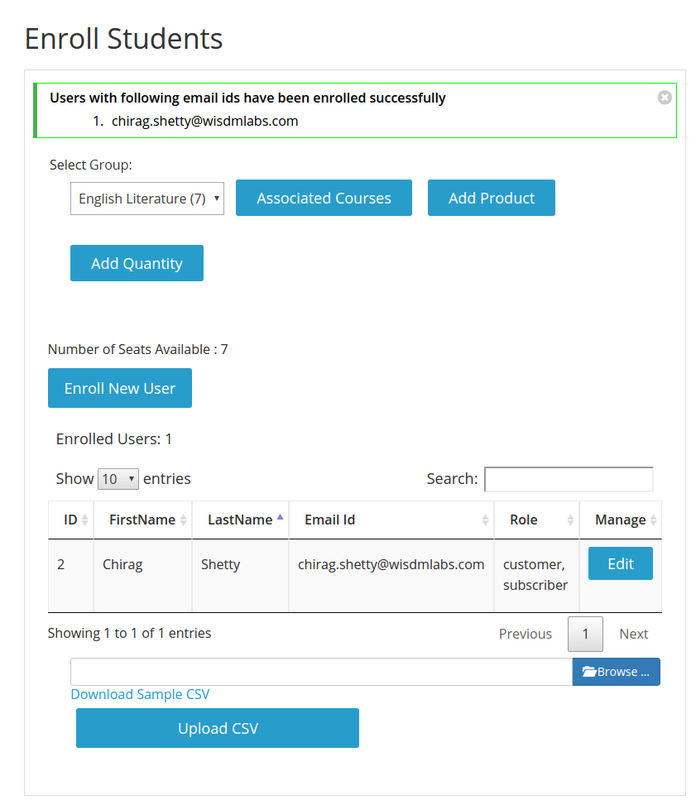 * Feature: Functionality to edit the group members details from user enrollment page. * Feature: Functionality to create not editing teacher role for the group manager on moodle. * Feature: Functionality to create manager role for the group manager on group product purchase. * Feature: Create single group for multiple products at the time of purchase. * Feature: Functionality to un-enroll user from group for the backend. * Feature: Email notification on group course product purchase. * Feature: Email notification on new members when added to the group. * Feature: Email notification on group member removal from group. * Feature: Functionality to edit email templates using Edwiser Bridge email manager. * Feature: Functionality to disable email notifications. 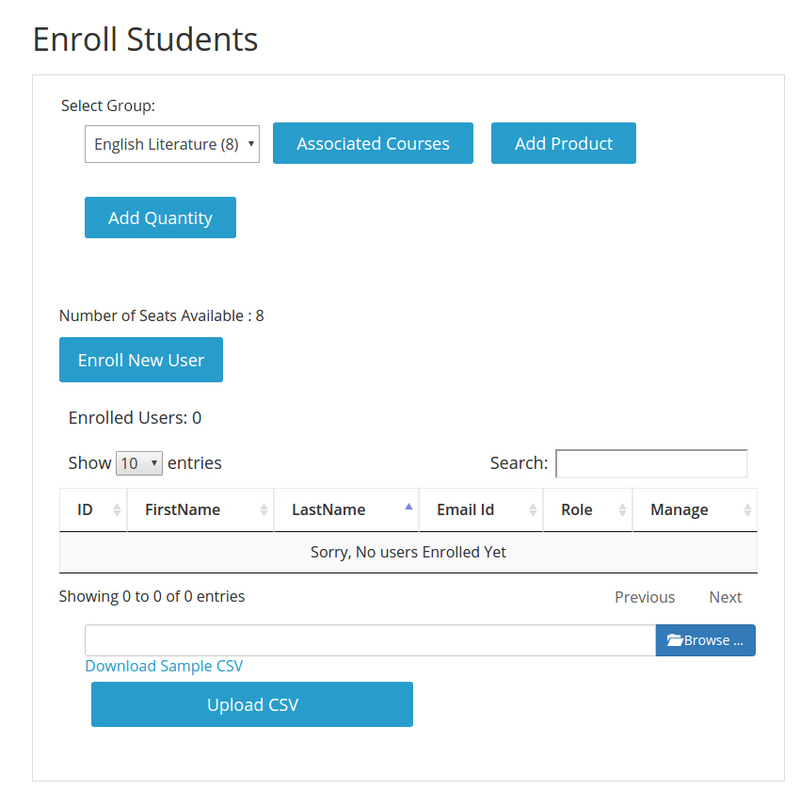 * Feature: Functionality to display the cohort enrollment details on the manage enrollment page. * Tweak: Woocommerce version 3.0.4 compatibility. * Tweak: New layout for the enroll user page. * Tweak: Used responsive data table for enroll student list. * Tweak: On single product page removed self enroll option and added group purchase option to enable group purchase for the course product. * Tweak: Automated self enrollment on single course product purchase, user will get enrolled to the product courses directly. * Fix: Fixed the warnings on the 404 page. * Feature: Made plugin translation ready. * Feature: Do not allow to add or remove courses from a product if it is sold and number of available seats of the sold product’s are greater than 0. * Feature: Do not allow a product to be permanently deleted when it is sold and the number of available seats of the sold product’s are greater than 0. * Tweak: Prevent same user enrollment in the same course product. * Tweak: Added message “Login required to enroll users” on Students Enrollment page. * Tweak: Added styles and animations on Students Enrollment page. * Fix: Fixed the compatibility issue with Revolution slider and the The7 theme. Get Popular Edwiser Bridge Extensions with Setup at 10% off the Total Price! Does the plugin have any prerequisites? Yes, the WooCommerce Integration extension will be needed for the Bulk Purchase extension to work. Which version of Moodle does the Bulk Purchase extension work with? 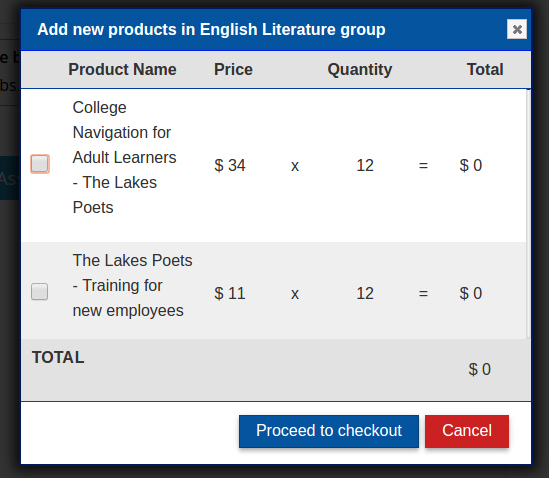 The Bulk Purchase extension works with Moodle version 2.9 and above. Which version of Edwiser Bridge does the Bulk Purchase extension work with? If I buy Course 1 in bulk for 4 students. I enroll 1 student. Then from your Enroll Student page, I purchase another product, Course 2 and add it to my Course 1 group. Now I enroll 2 more students. So will the 1st student be enrolled in Course 2? Yes, student 1 will automatically be enrolled in Course2 when you purchase it and add it to the group Course1. All students enrolled in the group will be enrolled in the newly purchased course. If a student purchases Course1, then the admin enrolls the student in a group using the enroll student page. Then if the admin unenrolls the student from the group, will the student still have access to the course? Yes, since the student initially purchased the course himself, he will just be unenrolled from the group but will not be unenrolled from the course. When I go to purchase a product from the Enroll Student page, why am I not able to choose the quantity of the product? Why is there a default quantity already mentioned there? The default quantity is the number of seats you have in the group to which you are trying to add the new Product to. 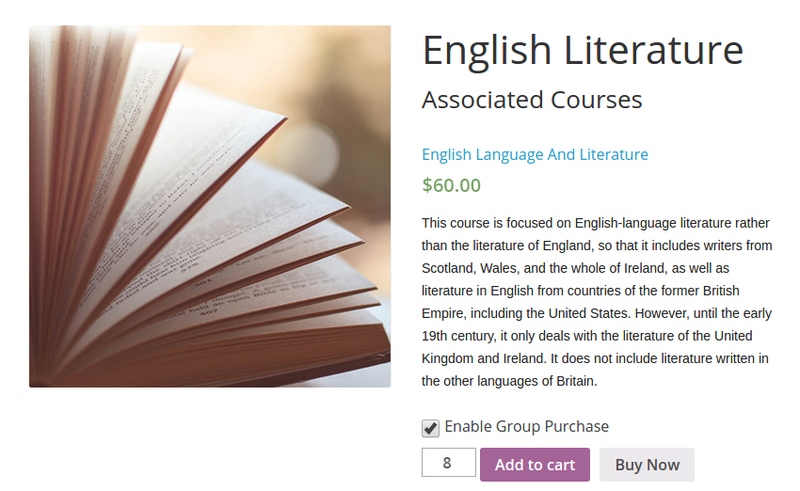 If you have purchased 5 seats in Course1, which has now become Group Course1, and you are adding Course2 to Group Course1 then you will need to purchase 5 seats in Course2 as well as all your students in Group Course1 need to be enrolled in Course2 as well. Every license you purchase is valid for one year, during which you will receive free support and updates. After the license expires you will still be able to use the plugin, but will not receive support or updates. To continue receiving support and updates, you will have to renew the license at a discounted rate, which is 50% of the extension price. The license for the Bulk Purchase extension is valid only for a single website. You could now buy more than one license. Each license can be used only on a single website. If you are already using the license on your staging site and want to now use it on your live site, go to Edwiser Bridge → Settings → Licenses and deactivate the plugin from your staging site. Now use the same license key on your live site. My license key is not activating. Sometimes the license key does not get activated because the ” curl_exec ” PHP file is not enabled in your WordPress. Once you have enabled this file your license key will be activated. I forgot to tick the Enrol Me checkbox while completing the purchase, how do I enrol myself in the course? You can enrol yourself just as you would any other user. Click on the Enrol Students link which you get in the email sent to you and enter your own details to enrol yourself. A counter will display the number of seats available. The Bulk Purchase functionality is not working on my website. What should I do? That’s unusual. Contact us using the support form on this site.